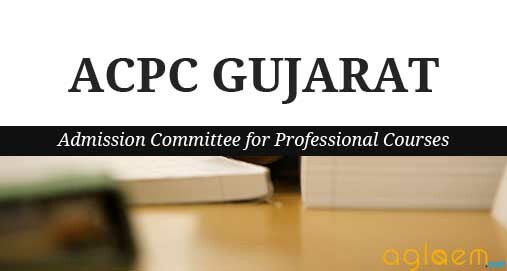 ACPC Engineering Registration 2018 – Candidates will be able to fill their registration form from the official website www.jacpcldce.ac.in and www.gujacpc.nic.in. Candidates are requested to read the instruction carefully before filling the registration form. Get ACPC Engineering Registration 2018 complete information here. Latest: ACPC has scheduled the last date to edit the registration form. Check the scheduled dates in the table given below. Candidates will register themselves through the link provided below as per official announcement. Candidates can register themselves from anywhere, Where the internet facility available. (If candidate is not from outside Gujarat). Candidates have to register online within time limit specified by ACPC. Visit the official website mention above from anywhere on the internet for Online Registration. To register as a new candidate click the “Click Here For New Registration” button. By doing so, New Registration window will be displayed on the computer screen. The candidate has to choose course name by selecting the option of choice for “Degree Engineering” from the combo and details will appear on the computer screen. After that, enter GUJCET-2018 Roll Number, Application number and Name of candidate as per the GUJCET-2018 mark sheet, 14 digit PIN as given with booklet, Serial No. Provided with PIN, and other details in the appropriate box. Verify the details entered and if every detail entered is correct, click “SUBMIT” button. Then, the Online Registration Form window will be displayed on the computer screen. The candidate has to fill up personal details in the format as displayed in Online Registration Form. 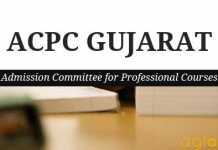 Candidate’s GUJCET-2018 roll number will appear as LOGIN ID. [It is mandatory to use the Candidate’s GUJCET-2018 roll number as LOGIN ID]. After that, the candidate has to enter a password by entering with at least 6 (six) and maximum 12 (twelve) alphanumeric characters. Re-enter the same password at the space marked as Confirm Password. For future login the candidate has to use the same Login ID, PIN and password only. So candidate has to remember the password for subsequent login. will be displayed. Provide the incomplete information and click “SUBMIT” button. By doing so, Registration Details will be generated. If any corrections are required then press “Edit Registration Details” button. The Online Registration Form will appear with already filled details which can be edited by the candidate. After editing, the candidate has to verify the details entered and if every detail found correct, click “Confirm Registration Details” button. No changes to registration details will be allowed after this. The candidate will be able to take printout of the Registration Details only after pressing “Confirm Registration Details” button. The candidate can click the “Print Your Details” button for printing Registration Details page. Candidates of Open NON-TFW category will get Registration Details online by clicking on “Registration Acknowledgement Slip for Open NON-TFW” button. By doing so, their registration will be confirmed. These candidates need not go to help center for confirmation of registration. Online Registration Slip will be generated. For other than Open NON-TFW category candidates after printing Registration Details, it is mandatory to report at Help Center for confirmation of registration. Otherwise his registration process will not be completed and his merit number (rank) will not be generated. For the confirmation of registration at Help Center, the candidate has to take printout of the Registration Details (two copies). Self-attested copies of all relevant documents (as per the list mentioned at the bottom of the Registration Details) should be attached with the Registration Details. Both candidate as well as parent/ guardian of the candidate has to compulsorily sign the Registration Details at the space provided. The candidate then has to reach at any nearby Help Center alongwith Registration Details and necessary attachments as well as all relevant original documents, compulsorily. If found necessary, then the Officer of Help Centre will retain all original documents and will give receipt for the same. Thereafter the candidate must collect the Registration Slip from Help Centre. The officer at the Help Center will verify the Registration Details and photocopies of relevant documents with originals. The officer will retain Registration Details and set of self attested documents, and issue the Registration Slip with signature and seal to the Candidate. It is mandatory for candidates of other than Open NON-TFW category to confirm the registration at Help Center and obtain Registration Slip, without which candidate shall not be eligible for further admission process.